(L to R) Isai Sanchez, Diana Salinas, Gama Sanchez, Angela Moyer, Gwen Groff and Steve Kriss on top of Monte Alban in Oaxaca. In the end, I believe that was the purpose of our Franconia Conference visit to Mexico: exploring and deepening relationships. Two Franconia Conference board members, Angela Moyer and I, and our Executive Minister, Steve Kriss, traveled to Mexico City, Puebla, Oaxaca, and Toluca and visited various congregations, pastors and leaders of Conferencia de Iglesias Evangélicas Anabautistas Menonitas de México (CIEAMM) for a week. Franconia Conference had helped to create CIEAMM in 1958, but the formal relationship ended about a decade ago. Our hosts for the week were CIEAMM’s conference moderator, Carlos Martinez Garcia and one of CIEAMM’s pastors, Oscar Jaime Dominguez Martinez. Together we visited congregations that had been planted and supported by Franconia Conference sixty years ago, as well as new ministries that have been emerging. 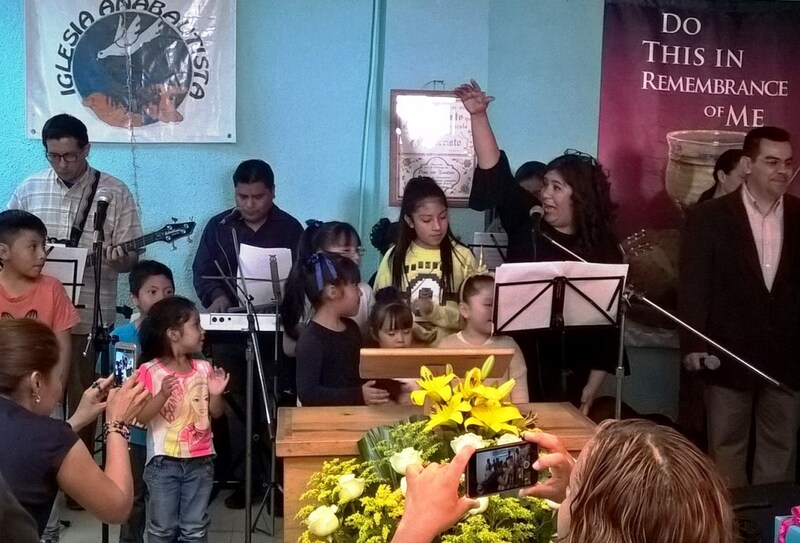 We first worshiped with Iglesia Maranatha in Puebla. Children and youth were fully involved in leading the service. 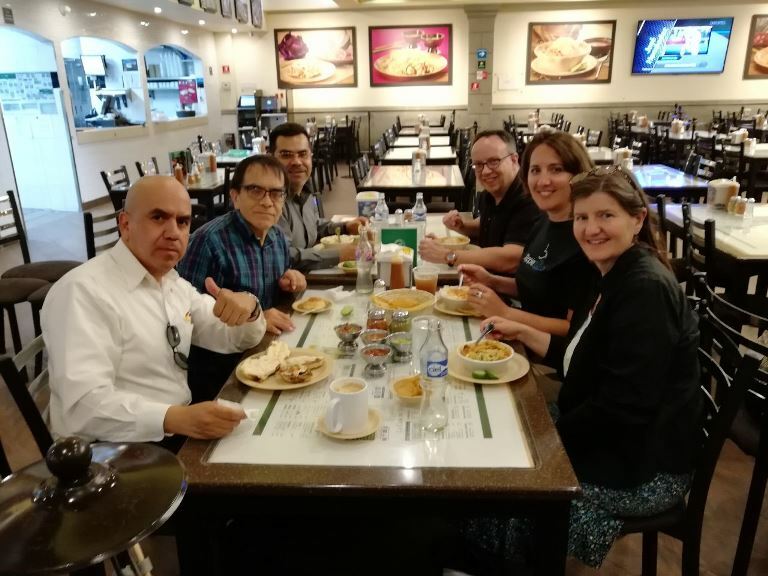 Over a meal of tostadas they enthusiastically invited Franconia Conference youth to please come and help them with their summer Bible School this July. The following day was a travel day back to Mexico City ending with a taco meal with the congregation at Fraternidad Cristiana Nueva Vida Espartaco. On Sunday, we worshiped with six of the congregations of CIEAMM. Steve shared a sermon on 1 Corinthians 12:12-26 “In the body of Christ, there are different parts, but not walls.” As usual, our worship concluded with a delicious meal together, and gifted musicians sang, drummed, bowed, plucked and strummed while we fellowshipped. We were overjoyed to see Ofelia Garcia and Victor Pedroza who had recently returned from 8 years of ministry in Chihuahua with colony Mennonites. Ofelia will be coming to Franconia Conference this September to share a weekend Sistering retreat with our Spanish-speaking sisters. During our time here, one seasoned Mennonite agency staff person shared with Steve some concrete advice about partnerships between the United States and Mexican church groups: Always relate as equals; never make the relationship about money; if money is exchanged, let it pass through conferences and congregations, not individuals; if you visit with a group, always include youth in the group. Juan Carlos Maya and Sara Zuniga, leaders at Centro Cristiano in Toluca. 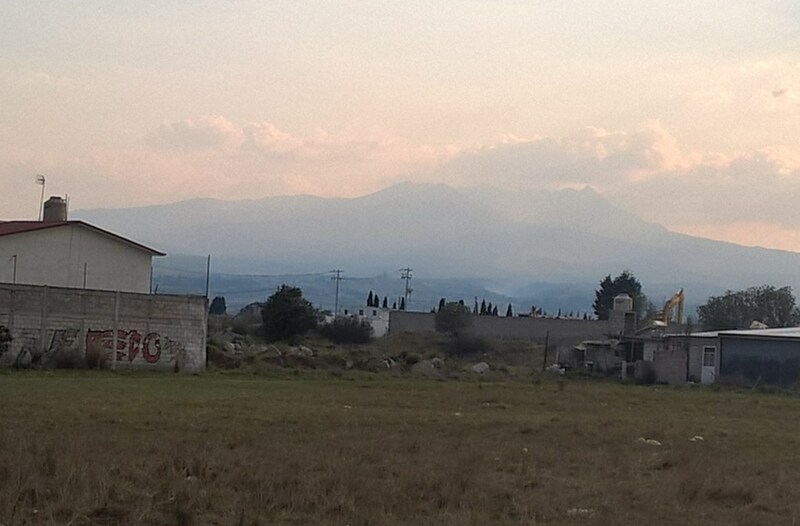 A visit to Toluca was our last journey. We met with Juan Carlos Maya and Sara Zuniga, leaders at Centro Cristiano. Sara’s mother was one of the first Mennonites Ken Seitz baptized, just before Sara was born. In the evening, we relaxed together, a small group of Anabaptists, sitting around an outdoor table in the plaza, listening to a band, watching the dancers, reminiscing about parents who gave up rumba and salsa dancing when they became Mennonites. At breakfast Sara showed us photo albums of her family that included Mennonites we know as Franconia Conference missionaries. Elders in these Anabaptist congregations who have been in leadership positions in their churches since they were young are intentionally stepping back in order to make space for new young leaders and to mentor them. 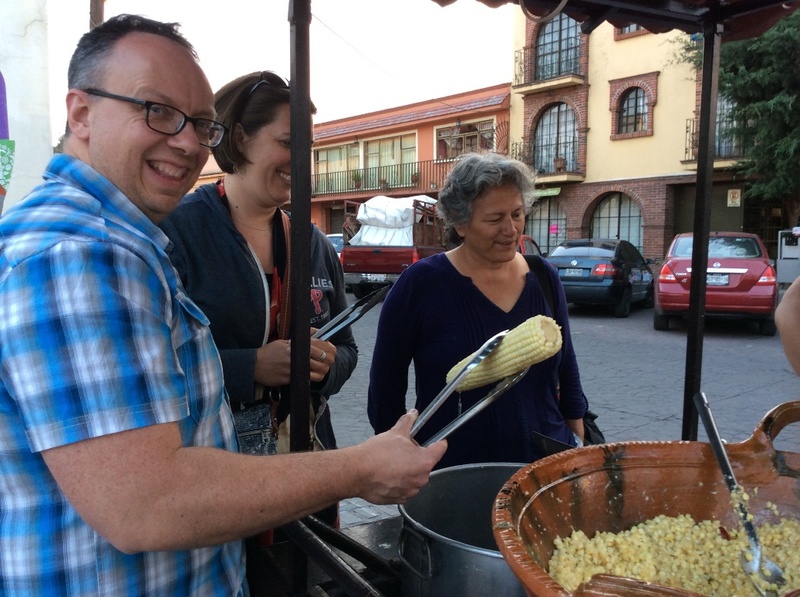 (L to R) Alberto Bielma, Pastor Carlos Martínez-García, Pastor Oscar Jaime Domínguez Martínez, Steve Kriss, Angela Moyer and Gwen Groff, eating pasole (a traditional Mexican soup). Our visits ended Monday evening with a meeting and meal with leaders from the congregations in Mexico City. They talked about their dreams for their congregations. Women pastors were especially warm in their welcome and enthusiastic about sharing their work and interest in receiving more training in theology and ministry. What if all we want is relationship? People repeatedly told us, “You have to come back. 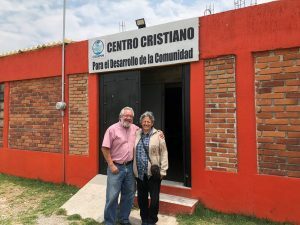 I can’t visit you, you must come here.” This was Angela’s fourth trip to CIEAMM congregations in Mexico, Steve’s third visit, my first. I learned much from my more fluent Franconia traveling companions. We three were grateful for the generous, meticulous planning of our CIEAMM hosts, Carlos and Oscar. We in Franconia Conference have much to learn much from our Anabaptist sisters and brothers in Mexico. I was grateful for one theological observation Carlos made in passing. He said, “Christianity is a religion of travel.” A cynical person might suggest that Carlos’ assertion is a bit self-serving. After all, he is a well-traveled Mexican Conference Moderator, journeying through Mexico, visiting churches with a group of Mennonites from the United States, about to embark on a visit to Kenya next week; of course he would believe Christianity is a religion of travel. A cynic might also suspect that my enthusiastic agreement with Carlos is colored by the fact that I’m the Franconia Conference board member from Vermont, grateful for a trip to sunny Mexico in early April when there’s still a foot of snow on the ground at home. Of course we all want to believe Christianity endorses travel! But I believe without cynicism that Carlos is right. Christianity started with journeys. Jesus walked hundreds of miles, and he and his disciples got in a boat and “crossed over to the other side” of the lake far more often than was strictly necessary. Think of the apostle Paul, Carlos said, who undertook many missionary journeys to spread the good news of Christ. In addition to what we bring when we visit, travel puts us in a new position to receive. Traveling makes us curious, vulnerable, and open to being wrong. Our bodies get tired. We may get a bit sick. We do not fully understand the language. We listen hard. We may break cultural rules we don’t even know exist. We laugh at our mistakes. All this is a good posture for sharing the story of the self-emptying Christ, for deepening our own faith, and for building relationships. Culto Unido: gathered worship in Mexico City with various leaders from 6 different congregations. 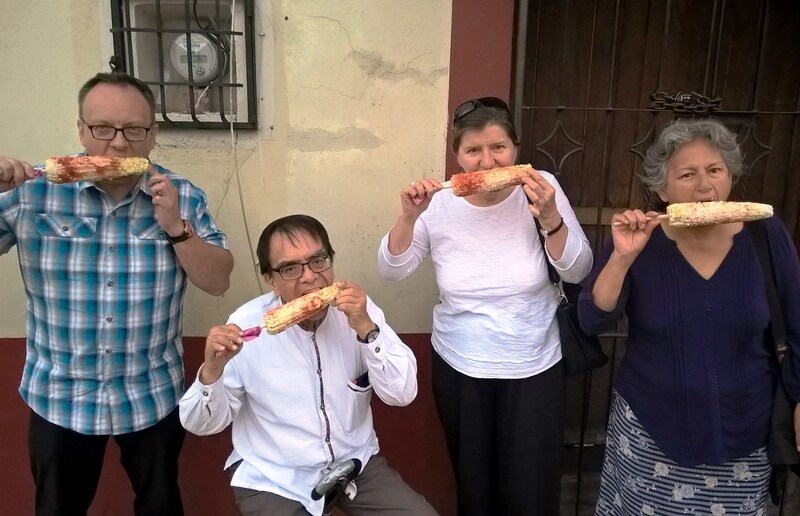 Steve, Carlos Martinez Garcia, Gwen and Sara Zuniga enjoying some elote! 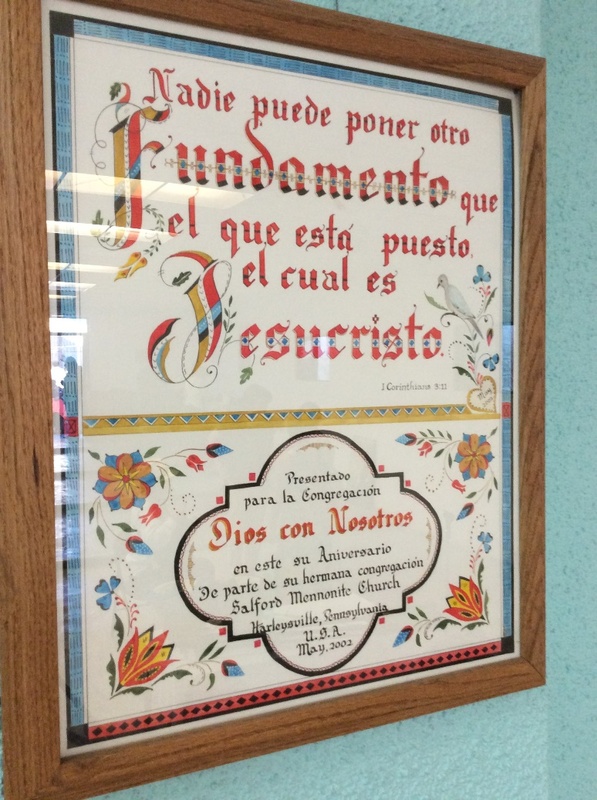 A fraktur presented by Salford Mennonite Church to Dios con Nosotros. PIcking out our ears of corn for elote in a village of Toluca. 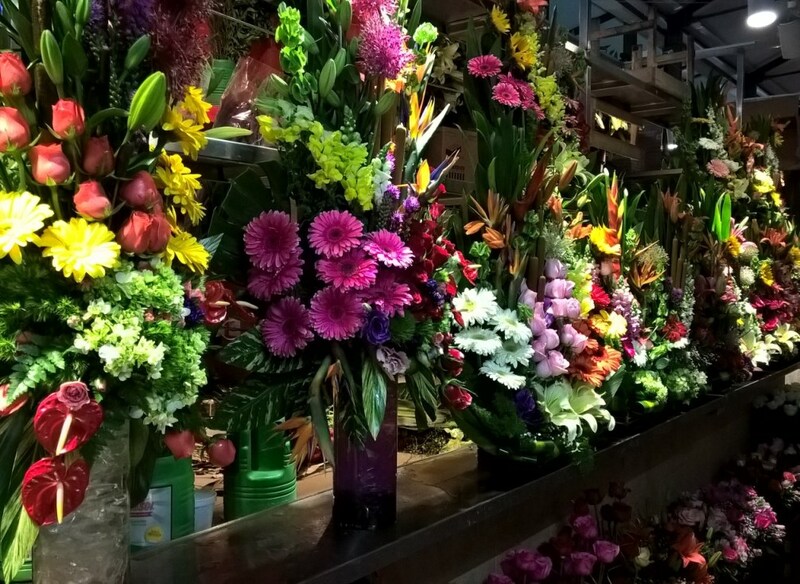 Flowers from a market in Oaxaca. The church building of Luz y Verdad. Angela having fun with girls from Centro Comunidad, learning songs in English and Spanish. All towns have cathedrals in the plazas. 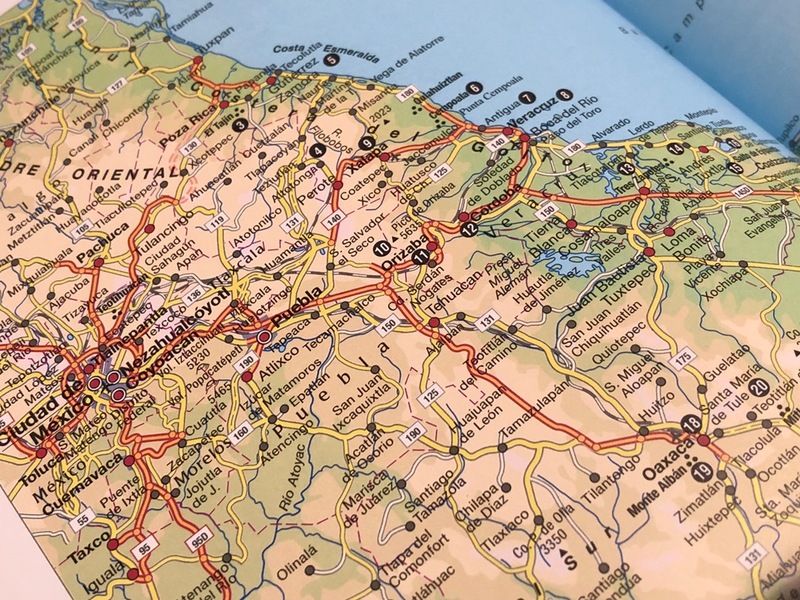 The 4 cities that we visited: Mexico City, Puebla, Oaxaca, and Toluca. Teníamos apenas uno o dos días en nuestro viaje a México cuando Steve Kriss, Ministro Ejecutivo de la Conferencia de Franconia, dijo: “Creo que todo lo que realmente piden ellos/ellas es una relación”. 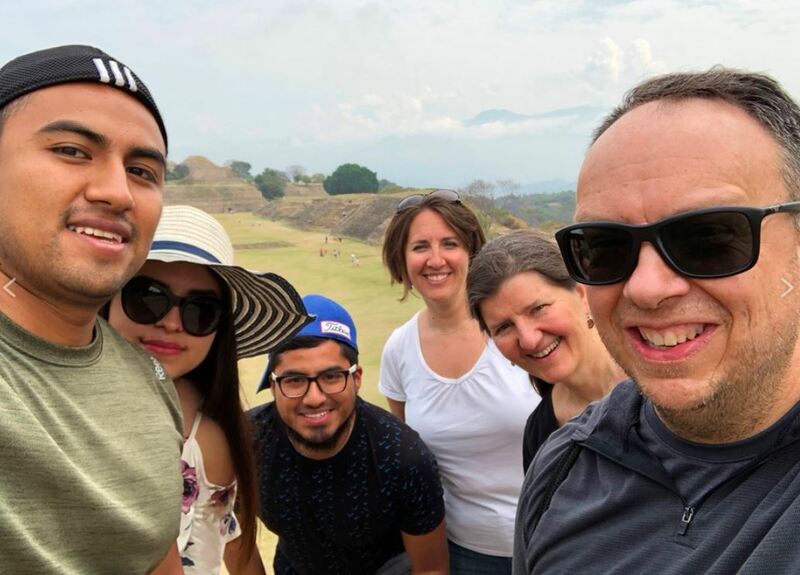 (De izquierda a derecha) Isai Sánchez, Diana Salinas, Gama Sánchez, Angela Moyer, Gwen Groff y Steve Kriss en la cima de Monte Albán en Oaxaca. Al final, creo que ese fue el propósito de nuestra visita de la Conferencia de Franconia en México: explorar y profundizar las relaciones. Dos miembros de la junta de la Conferencia de Franconia, Angela Moyer y yo, y nuestro Ministro ejecutivo, Steve Kriss, viajamos a la ciudad de México, Puebla, Oaxaca y Toluca y visitamos varias congregaciones, pastores y líderes de la Conferencia de Iglesias Evangélicas Anabautistas Menonitas de México (CIEAMM) durante una semana. La Conferencia de Franconia había ayudado a crear CIEAMM en 1958, pero la relación formal terminó hace una década. Nuestros anfitriones de la semana fueron el moderador de la conferencia de CIEAMM, Carlos Martínez García y uno de los pastores de CIEAMM, Oscar Jaime Domínguez Martínez. Juntos visitamos congregaciones que habían sido plantadas y apoyadas por la Conferencia de Franconia hace sesenta años, así como nuevos ministerios que han estado surgiendo. Primero alabamos al Señor en la Iglesia Maranatha en Puebla. Los niños y los jóvenes se involucraron completamente en dirigir el servicio. Durante una comida de tostadas, invitaron con entusiasmo a los jóvenes de la Conferencia de Franconia a venir y ayudarlos con su Escuela Bíblica de verano este julio. 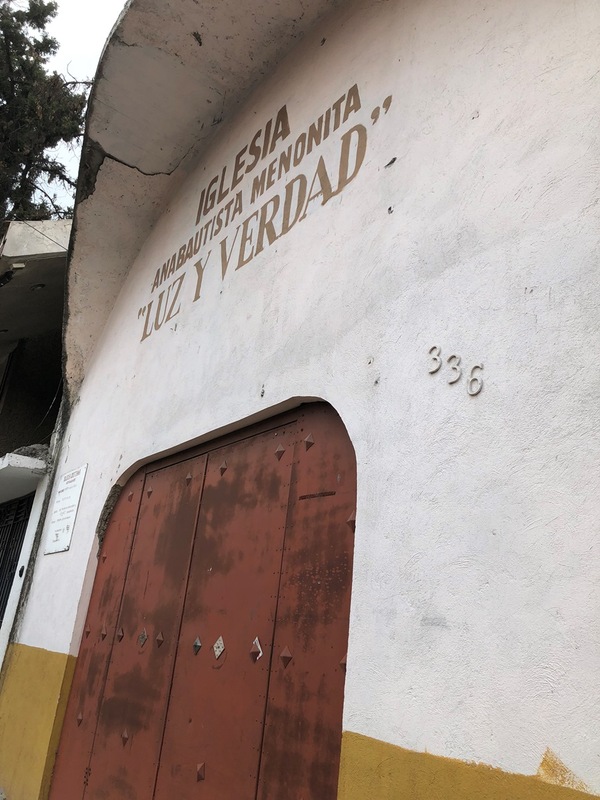 Al día siguiente viajamos a Casa de Esperanza en Oaxaca, donde la congregación se reúne en la casa de Luis R. Matias. Cantamos y tuvimos un breve estudio de la Biblia y una larga comida de tlayudas, una tortilla local. Nos reunimos con estudiantes universitarios y adultos jóvenes que están fuertemente comprometidos con trabajar por la justicia. Escuchamos acerca de su sueño de un lugar para ayudar a satisfacer las necesidades de los refugiados centroamericanos que pasan por su pueblo. Los líderes oaxaqueños desean más capacitación en la transformación de conflictos. Los dones musicales en esta comunidad eran abundantes, y su calidez y alegría eran inmensos. Terminamos el día con el té con Luis en un café donde su hija Paloma cantaba y tocaba la guitarra. Luis dijo: “¿No es esto muy bueno9? A mi hija le pagan para que me cante mientras yo como “. 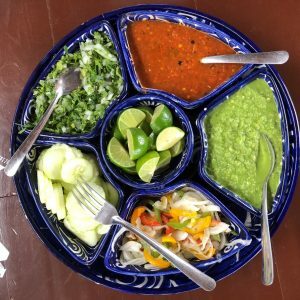 El día siguiente fue un día de viaje de regreso a la Ciudad de México, terminando con una comida de tacos con la congregación Fraternidad Cristiana Nueva Vida Espartaco. El domingo, rendimos culto seis de las congregaciones de CIEAMM. Steve compartió un sermón en 1 Corintios 12: 12-26 “En el cuerpo de Cristo, hay diferentes partes, pero no paredes”. Como de costumbre, nuestra adoración concluyó con una deliciosa comida en conjunto, y los músicos talentosos cantaron, tocaron, hicieron una reverencia, puntearon y rasguearon mientras nosotros compartíamos. Nos llenó de alegría ver a Ofelia García y Víctor Pedroza que habían regresado recientemente de 8 años de ministerio en Chihuahua con colonos menonitas. Ofelia vendrá a la Conferencia de Franconia este septiembre para compartir un retiro de hermandad de fin de semana con nuestras hermanas hablantes del español. Durante nuestro tiempo aquí, un miembro experimentado de la agencia menonita compartió con Steve algunos consejos concretos sobre las asociaciones entre los Estados Unidos y los grupos eclesiales mexicanos: relacionarse siempre como iguales; nunca hagas la relación en base al dinero; si se intercambia dinero, déjalo pasar por conferencias y congregaciones, no por individuos; si visitas con un grupo, siempre incluye a los jóvenes en el grupo. Juan Carlos Maya y Sara Zuniga, líderes en el Centro Cristiano en Toluca. Una visita a Toluca fue nuestro último viaje. Nos reunimos con Juan Carlos Maya y Sara Zuniga, líderes del Centro Cristiano. La madre de Sara fue una de las primeros menonitas bautizados por Ken Seitz, justo antes de que Sara naciera. Por la tarde, nos relajamos juntos, éramos un pequeño grupo de anabautistas, sentados alrededor de una mesa al aire libre en la plaza, escuchando a una banda, mirando a los bailarines, recordando a los padres que abandonaron la rumba y la salsa cuando se convirtieron en menonitas. Durante el desayuno, Sara nos mostró álbumes de fotos de su familia que incluían menonitas que conocemos como misioneros de la Conferencia de Franconia. El lunes, visitamos su centro comunitario y escuchamos una apasionada presentación en power-point (no es un oxímoron). Estos anabautistas en Toluca enseñan a los niños a tocar instrumentos musicales como parte de una orquesta, como una forma de entender el cuerpo de Cristo. Con lecciones de música en grupo, están construyendo una comunidad. Juan Carlos y Sara nos mostraron los planes para la expansión de sus edificios y nos presentaron a un vecino con una operación de fabricación de ladrillos. Cuando Juan Carlos caminó por las polvorientas calles de Toluca, los niños corrieron hacia él, lo abrazaron y caminaron cogidos del brazo con él. Ángela dijo acerca de Juan Carlos: ” Él es lo que Jesús hubiera sido, si Jesús hubiera llegado a los 60.” Su comprensión del ministerio (de Juan Carlos) es un movimiento desde la “solidaridad primero, luego a Jesucristo, en última instancia a Koininia”. Dijo que lo opuesto a esto es “ego” primero, luego el hedonismo, que finalmente conduce al capitalismo “. Los ancianos en estas congregaciones anabautistas que han estado en posiciones de liderazgo en sus iglesias desde que eran pequeños están retrocediendo intencionalmente para dejar espacio para nuevos líderes jóvenes y para ser mentores de ellos. Nuestras visitas finalizaron el lunes por la noche con una reunión y comida con los líderes de las congregaciones en la Ciudad de México. Estos hablaron sobre sus sueños para sus congregaciones. Las pastoras fueron especialmente cálidas en su acogida y entusiastas de compartir su trabajo y su interés en recibir más capacitación en teología y ministerio. ¿Qué pasa si todo lo que queremos es una relación? La gente repetidamente nos dijo: “Tienes que volver. No puedo visitarte, debes venir aquí “. Este fue el cuarto viaje de Angela a las congregaciones de CIEAMM en México, la tercera visita de Steve, la primera para mi. Aprendí mucho de mis compañeros de viaje más francos de Franconia. Los tres estábamos agradecidos por la planificación generosa y meticulosa de nuestros anfitriones de CIEAMM, Carlos y Oscar. Nosotros en la Conferencia de Franconia tenemos mucho que aprender mucho de nuestras hermanas y hermanos anabautistas en México. (izquierda a derecha) Alberto Bielma, Pastor Carlos Martínez-García, Pastor Oscar Jaime Domínguez Martínez, Steve Kriss, Angela Moyer and Gwen Groff, comiendo pozole. Agradecí una observación teológica de pasada que hizo Carlos: “El cristianismo es una religión de viajes”. Una persona cínica podría sugerir que la afirmación de Carlos era un poco egoísta. Después de todo, es un Moderador de la Conferencia Mexicana muy viajado, viaja a través de México, visitando iglesias con un grupo de menonitas de los Estados Unidos, a punto de emprender una visita a Kenia la próxima semana; por supuesto, él creería que el cristianismo es una religión de viajes. Un cínico también podría sospechar que mi entusiasta acuerdo con Carlos está teñido por el hecho de que soy miembro de la junta directiva de Franconia Conference de Vermont, agradecida por un viaje al soleado México a principios de abril, cuando aún queda un pie de nieve en el suelo en casa. . ¡Por supuesto, todos queremos creer que el cristianismo aprueba el viaje! Pero creo, sin cinismo, que Carlos tiene razón. El cristianismo comenzó con los viajes. Jesús caminó cientos de millas, y él y sus discípulos subieron a un bote y “cruzaron al otro lado” del lago con mucha más frecuencia de lo necesario, estrictamente hablando. Piensa en el apóstol Pablo, dijo Carlos, quien emprendió muchos viajes misioneros para difundir las buenas nuevas de Cristo. Además de lo que traemos cuando viajamos, viajar nos pone en una nueva situación para recibir. 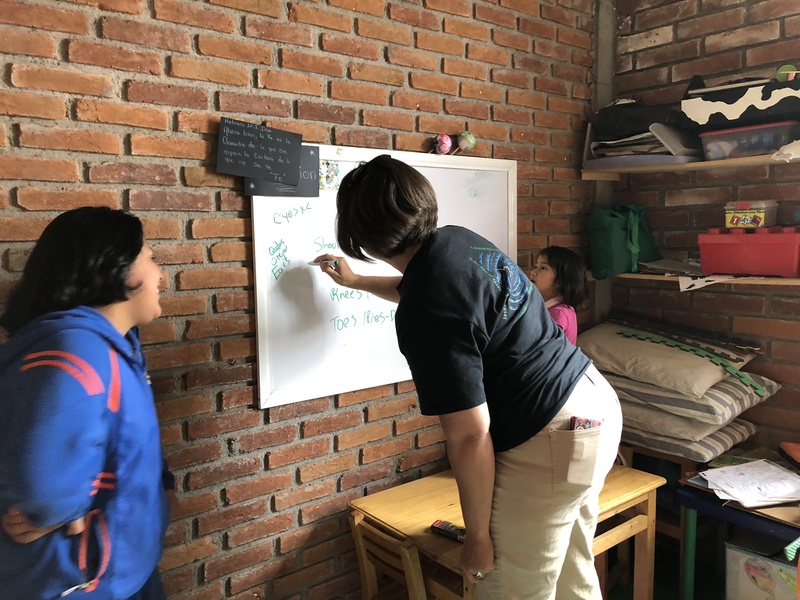 Rockhill Mennonite (Telford, Pa) youth pastor, Angela Moyer, had taken groups of high school youth to Mexico City to do mission work before, but this time was different. This time, Moyer wanted to bring young adults and focus on building relationships. This past July, she traveled with a Franconia Conference-sponsored team to do just that. 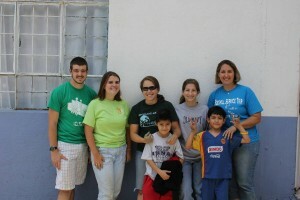 (from left to right) Benjamin Sutter, Rachel Spory, Janine Bergey, Oliver, Deanne Delp, Hezrael, and Angela Moyer. Moyer was joined by Janine Bergey, also from Rockhill, Deanne Delp, from Laurel Street Mennonite in Lancaster, Pa., Rachel Spory, from First Mennonite in Johnstown, Pa., and Benjamin Sutter from Kern Road Mennonite in South Bend, Ind. 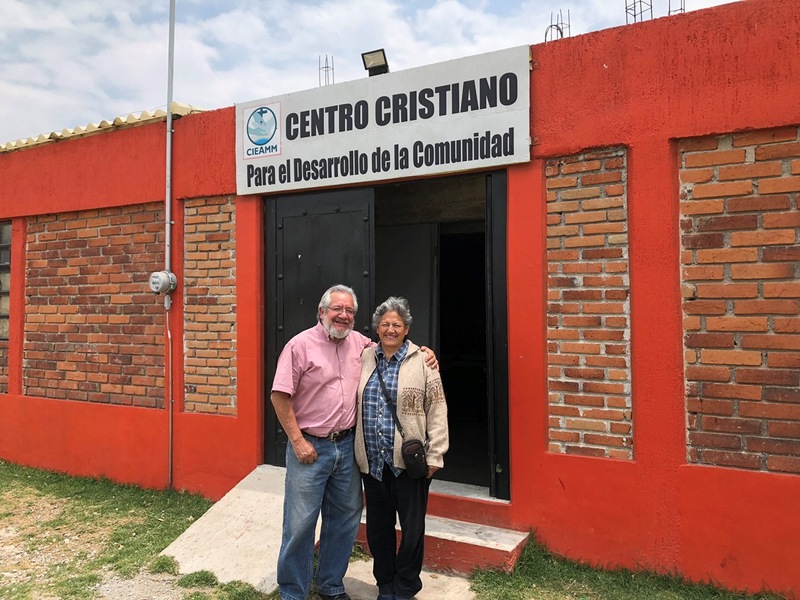 Although most of the team spent their time at Iglesia Anabauptisa Menonita Fraternidad Christiana Prensa, Moyer and Spory also traveled to Iglesia Anabauptisa Menonita Fraternidad Christiana Espartaco for five days of the trip to assist with a shortened Bible School week there. “Espartaco was a joyful and kind church,” said Moyer. They even moved the site of their Bible School to a location closer to a community with more children, she said. While in Prensa, the group connected with Alicia Alvarez Uzcango and Ariel Avila Muñoz, a couple who serve on the Prensa leadership team. Alvarez and Avila, who also organized Bible School, emphasized lives of Christian service, along with the importance of Scripture. “We understand that we need to have a balance of both the theology and living it out,” said Muñoz, through a translator. Hosting a week of Bible School during the summer is one way the church is reaching out to the surrounding neighborhood; only five of the forty kids who participated in Bible School attend the church regularly. 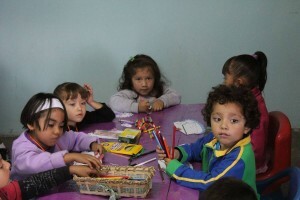 “Bible School is not just for the kids, it’s for the families of the kids,” said Alvarez. Kids from the bible school color paper cakes to attach to paper aprons and chef hats. One man who attends the church, Manwell, brought his sobrinos (nephews and nieces) to Bible School for the first time. He told Avila that they sang the Bible School songs at home all evening. Overall, the relationships left an impact on the Franconia Conference group. “[Prensa is] a small congregation with much potential for growth, impact and outreach in their community,” added Bergey. The team, as well as leadership in both churches, is hopeful about future relationships between Franconia Conference and CIEAMM. “Each conference has gifts that God has given to the people there,” said Delp. From Emma . . .On a November Sunday morning, J. Mark and I sat in an auditorium in the center of Mexico City surrounded by brothers and sisters, many of whom we hadn’t seen for a long time. It is seven years since we left Mexico. We’ve been back a few times and have been in contact with many of them now and then. But in this setting whole families gathered together and it felt like a family reunion. The children I taught in Sunday School are teenagers and I had to concentrate on their faces to recognize them. The teenagers are now adults and leaders in the church. Young couples have reached middle age, and some gray hairs have snuck in among the black ones. A few more wrinkles tell me that years have passed. Mexicans are very relational people and I saw the same warmth I always remembered as we greeted one another and rejoiced in God’s goodness to us. The worship of God together was energetic to say the least. Booming voices now and then behind us shouted out ”Gloria a Dios!” or “Aleluya!” There was no doubting that these people were there to celebrate. As they called out the names of churches and their people stood up, everyone cheered. We felt at home! The day before, we joined pastors and lay leaders as we spent a day reflecting on the struggles of the past, identifying where they are now and looking toward the future. Many questions were asked about what it means in their present reality to be Anabaptist Mennonites in Mexico. Young pastors and leaders, who had been teenagers when we left, now led out with vision and energy with a new wave of enthusiasm demonstrating their hope for the future. We rejoiced as they glorified Jesus and spoke of new initiatives to reach out to youth and families. There is no doubt that they have encountered Jesus in new ways and God’s Spirit has been working among them. The seeds that had been planted 50 years ago in such an imperfect way were bearing fruit, and God is building the church. All along the way and throughout the years God’s Spirit has been there and Jesus has walked with them to create a new sense of community in that huge metropolitan reality. Much diversity among them and the many difficult realities of the city, such as the distances between the churches, all add to the challenges that face them. 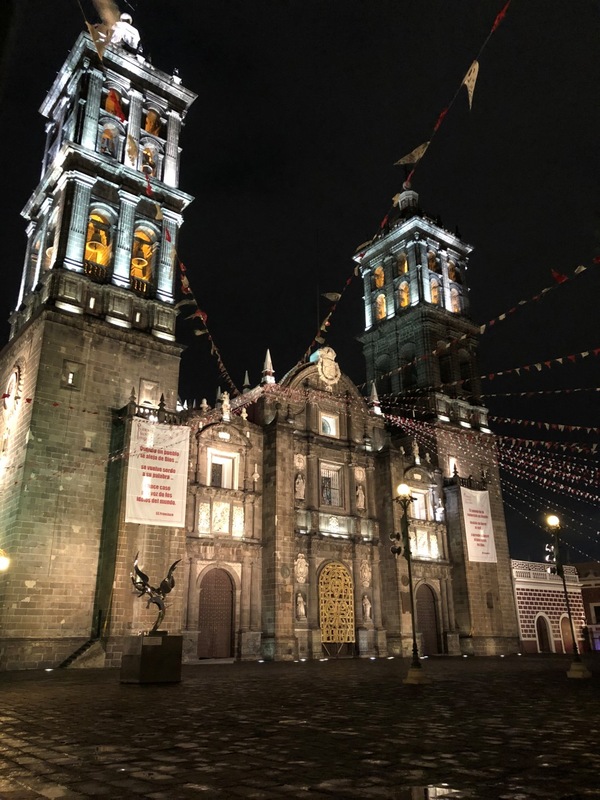 We were impressed, however, with the maturity of leadership that is in place to face these challenges and experience the growth of the Kingdom of God in the metropolitan area of Mexico City and Puebla. From J. Mark . . .We want to thank Swamp Mennonite Church and Franconia Conference for making it possible to attend the fiftieth anniversary of the founding of the Conferencia de Iglesias Evangélicas Anabautistas Menonitas de México (CIEAMM). We were also pleased to represent both Franconia Conference as well as Mennonite Mission Network in gatherings that took place. We come back with the certainty that God’s kingdom purposes are being worked out in the Mennonite congreagtions of CIEAMM because of the faithfulness of our brothers and sisters. To God be the glory!